At the end of our last walk we had to abort due to bad weather. Today, when we arrived to pick up where we had left off, Mr Blue Sky was back out and smiling down on us. 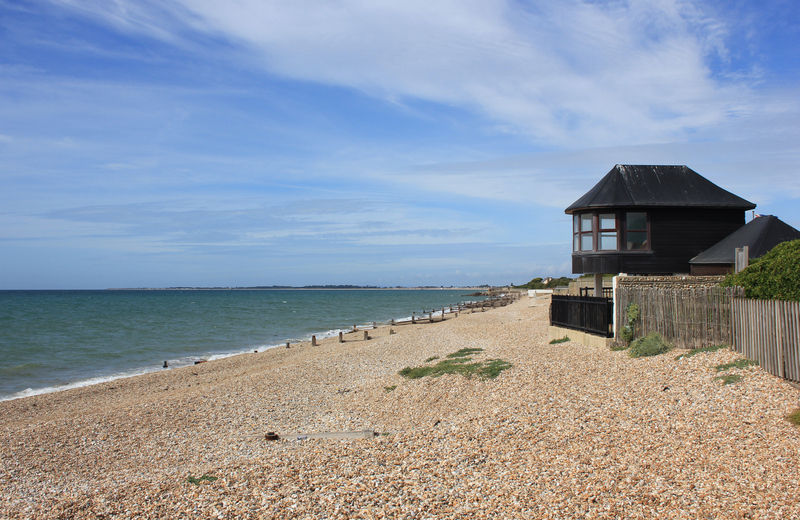 As we walked along the shingle beach we passed a raised outbuilding, a cabana of sorts. If I lived at the coast I would like to have one of these. Walking on shingle, at the best of times, is a trudge. Where possible, we avoided it. As we approached Pagham we passed its yacht club. There was some form of race going on. Dinghies sailed up and down, round and round each other, intermingling in a bedlam of boats, some going this way and some that. Every now and again a blast from a siren would signify something, although what that something was I had no idea. Over a period of ten minutes or so this continued, until all of a sudden, after a final blast of the siren, all of the pilots turned their boats as if they were one and raced off east. According to our map we would have to detour inland at Pagham Harbour, around a marsh. But the tide was out and it looked as if we might be able to cut across the entrance to the marsh and avoid the detour. What luck! What do you reckon? Sure there’s a spit of land poking out but to me it looked as if the horizon was continuous. It looked to me as if we could nip across and continue on our way. Oh, how I lived in hope for the few miles it took us to reach the inlet itself. The closer we got, the more my hope dwindled. By the time we arrived I realised that there was quite a body of water between us and the other side of the inlet. Rule #1: Trust the Map. This was not the first time I had abandoned the map in the vain hope that it lied. When Ben, my son, found out that we would have to walk several miles inland, he became a bit despondent. He exhibited this by stomping out his frustration in the shingle. Never stomp on shingle. The harder you stomp the more you sink. He was almost up to his knees, he was so angry. Poor old Ben; we pulled him out, dusted him off and started our trek inland. 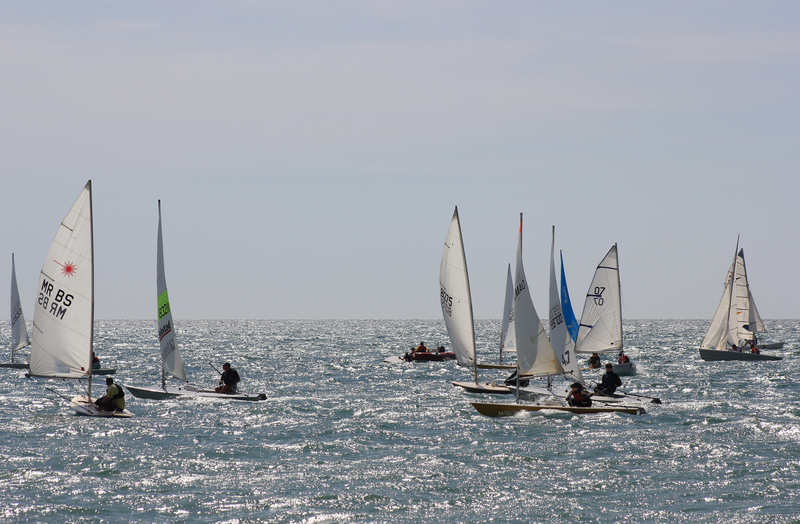 This entry was posted in West Sussex and tagged coast, dinghy, pagham, shingle, travel, walking, west sussex. Bookmark the permalink. 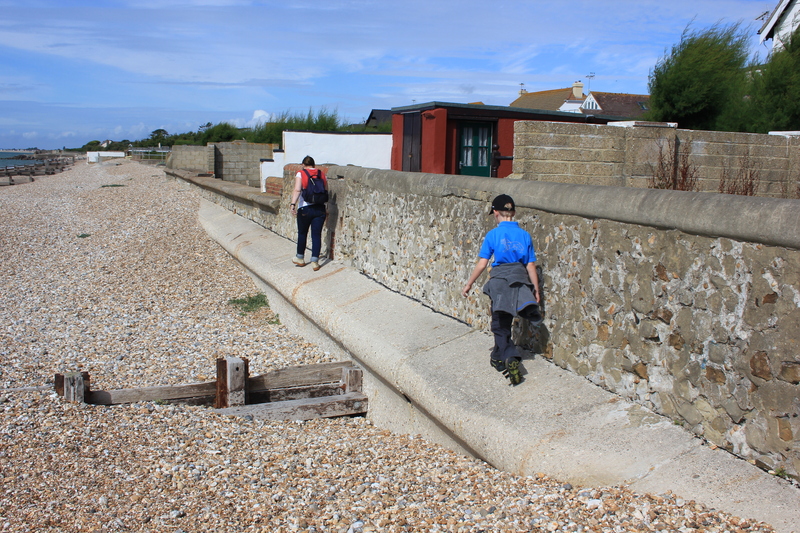 Surely “Stomping on Shingle” is a perfect title for the book – or indeed the film – of your epic coastal walk. Starring Ben, obviously. That’s a great idea, except I think Ben might be one of those actors who would refuse to come out of his caravan when filming started, what with the mood he was in that day! 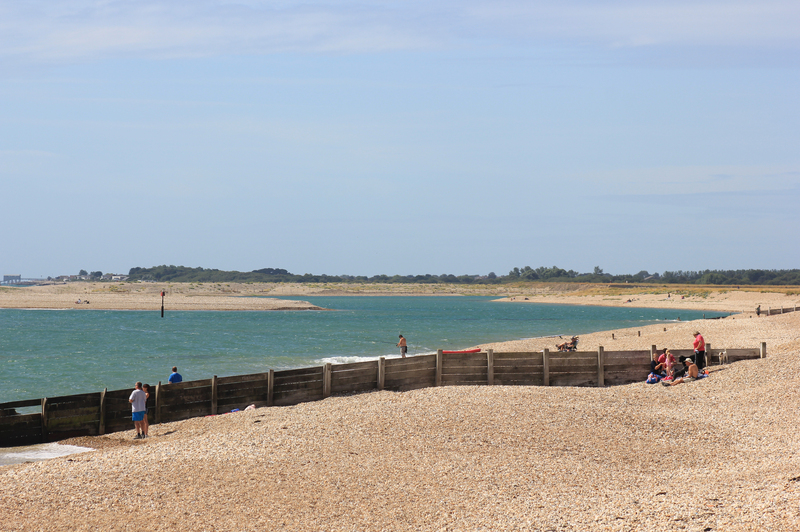 I enjoyed the walk around Pagham harbour, it made such a nice change from the miles of shingle. Maybe packing chest waders in your packs would let you guys take some short cuts? Such a beautiful stretch of coastline! I’d love to plop down in a comfy chair at the windows of that little building. What a view!